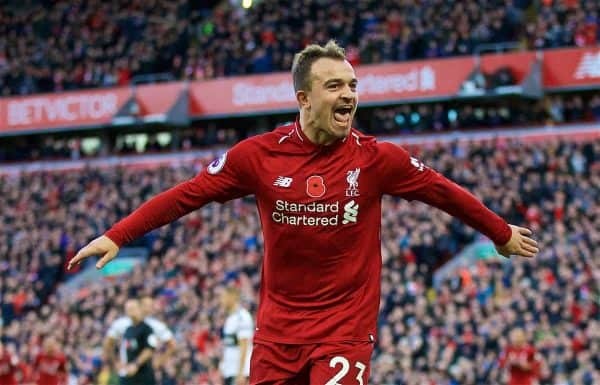 Liverpool secured another comfortable win in the Premier League on Sunday, returning to the top of the table with a 2-0 victory over Fulham at Anfield. After the humiliation of a 2-0 loss at Red Star in the Champions League, Liverpool were handed a great opportunity to respond as relegation candidates Fulham headed to Anfield. Jurgen Klopp saw his side’s failings come to a head in Belgrade, and insisted they were unable to “find their mojo” as two goals from Milan Pavkov sealed a second loss in Europe. Taking on a Cottagers side with just one win in 11 games in the Premier League prior to their trip to Merseyside, scoring 11 and conceding 29, the expectation was on the Reds to bounce back. Klopp made four changes to his starting lineup from the Marakana, with Joe Gomez, Fabinho, Xherdan Shaqiri and Roberto Firmino brought back into an exciting side. And with another international break to come between Sunday’s meeting and the away clash at Watford, Liverpool returned to winning ways with a solid result. After a minute’s silence to mark the 100-year anniversary of the end of the First World War, it took a while for the atmosphere to build at Anfield. Liverpool almost got off to a bright start, however, as Gomez released Trent Alexander-Arnold down the right, with his cross touched down by Firmino only for Sadio Mane to curl well wide. Former Liverpool target Ryan Sessegnon had a brilliant chance to open the scoring just after the 20-minute mark after Aleksandar Mitrovic’s knock-on, but his effort was off target. 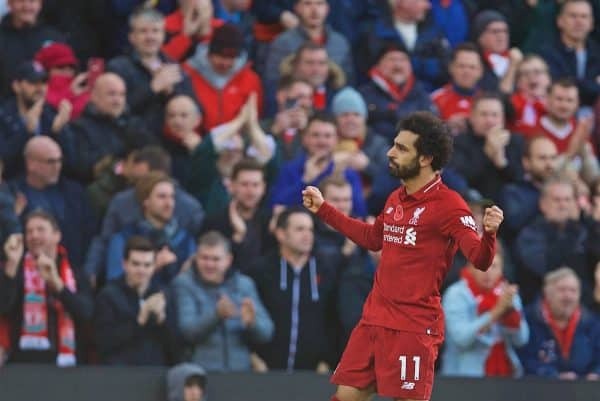 Mitrovic had the ball in the back of the net only to be ruled out for a contentious offside, and seconds later Liverpool had the ball up the other end for Mohamed Salah to fire home to make it 1-0. The Reds headed into half-time with the lead, which was arguably deserved after a largely dominant showing undermined by a lack of cutting edge. Liverpool kept up the pressure after the break, and within 10 minutes they were 2-0 up, with Andy Robertson curling in a deep cross and Shaqiri beating Sergio Rico with a sumptuous back-post finish. Robertson stung Rico’s palms as the hosts continued to find space in the final third, with the Spanish goalkeeper keeping Fulham from enduring a rout in the opening hour. Jordan Henderson made his return to action midway through the half, taking over from Gini Wijnaldum to make his first appearance since the 1-0 win at Huddersfield. 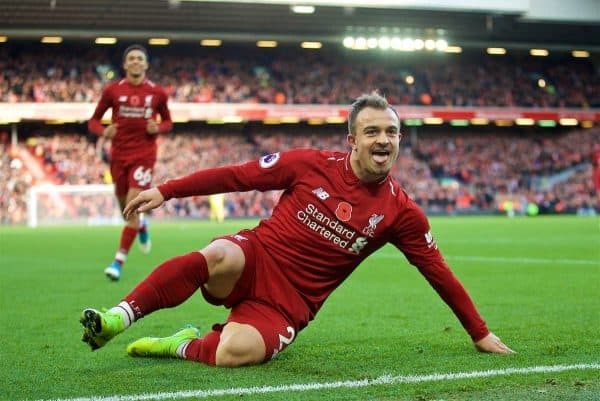 The visitors resorted to a damage limitation exercise after Shaqiri’s goal, however, and Klopp’s side were left to settle for another comfortable, but low-scoring, victory.